Through our work in the water damage restoration area we found that on some occasions the water damage that we were attending had occurred some time ago. This time lag was leading to secondary mould problems that were in some cases seriously compromising the health of the building inhabitants. That was many years ago and it led us to seek out the best possible training and partnering arrangements. 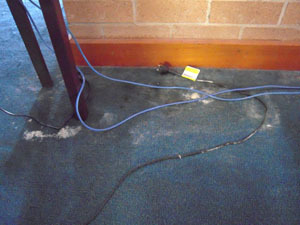 We are Australian Certified Mould Investigators and Remediators. All of our laboratory testing and technical advice is taken care of by Mycologia Australia. Mould Investigation and Remediation like a lot of other areas is forever changing as new studies and methods of testing become available. It is absolutely critical for us to have Mycologia on board, why? Because that�s what they do, mould. In fact the Australian Mould Guidelines and the reference manual for remediators and inspectors was written by the Principles Dr Peter Kemp and Dr Heike Neumeister- Kemp. So mould is it as bad as they say or is it all hype? I do believe we need to take it seriously whilst avoiding the hype that can happen from time to time, it�s important to keep it in perspective. If you suspect you have a mould problem, get us to check it out, simple. Don�t leave it believing it will get better, illness due to mould problems can often happen gradually over time without you noticing. There have been numerous studies, many of them still ongoing which show links between Mould and Fungi and some pretty nasty health issues in people, we have seen plenty of cases ourselves. Like a lot of things prevention is the key. Here are a few tips to help you keep the mould and fungi in your environment under control. If you have a water damage problem from whatever source make sure it�s attended to quickly. Keep an eye out for moisture build up where it shouldn�t be, it could be a leaking pipe in a wall, get it fixed. Use exhaust fans in bathrooms to take the humid air outside. Vent clothes dryers outside or again use exhaust fans to take the humid air out. Vent your gas heating appliances outside. Open your windows to allow air from outside to circulate throughout your house or building. It�s not an old wives tale, let the fresh air in. If your on a sloping block of land. Make sure there is adequate drainage to take water away from the building. Don�t let water build up behind walls.